The nights are getting quite chilly this time of year. 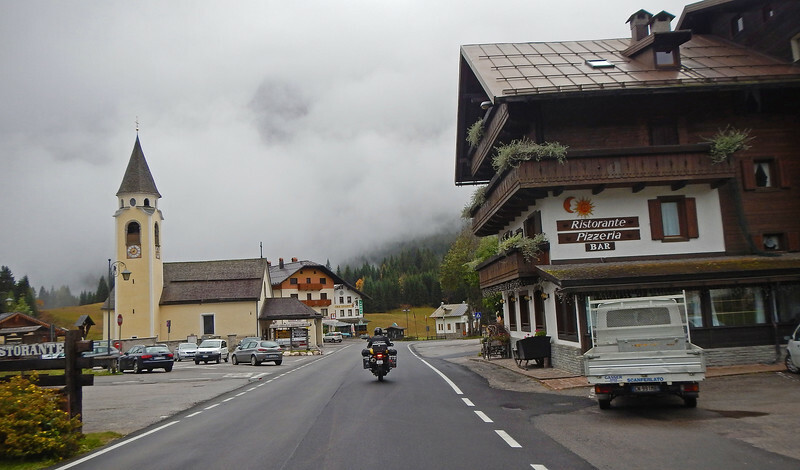 We've settled in for the evening in a really quaint wooden lodge in this tiny one-street village of Sappada right in the heart of the Dolomites. 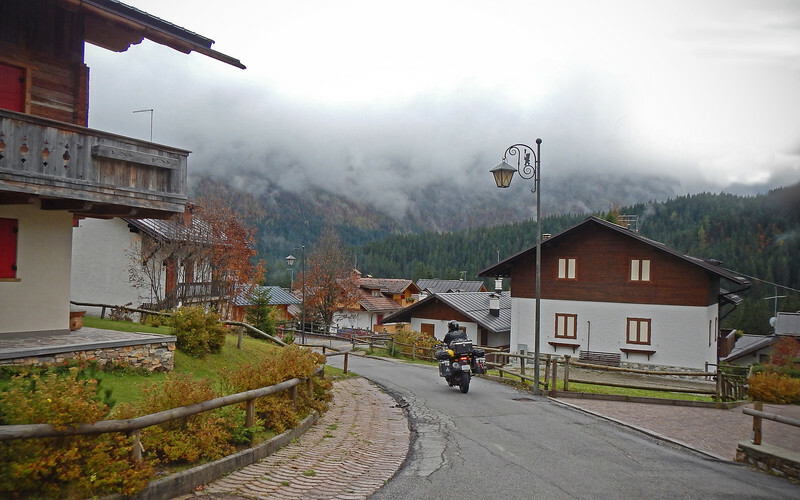 It's a very popular destination for skiers in the wintertime, but at this time of year the place is eerily quiet - an alpine ghost town. I kinda like it. And I love that we booked the lodge for a fraction of the price that it would list for in the middle of ski season. Feels like we're on vacation! Neda gets warm and cozy in bed with a good movie. Big day planned for tomorrow! I can't complain though. We've had such an awesome stretch of nice weather over the last few weeks, marred only by a handful of rainy days. That's quite uncharacteristic for us. So in the back of my mind I was always anxiously waiting for the other shoe to drop. The only sad part is that this streak had to end while we're in the midst of a motorcyclist's playground. We watched from the warmth of our comfy and toasty lodge and waited for any sign that the showers would abate. 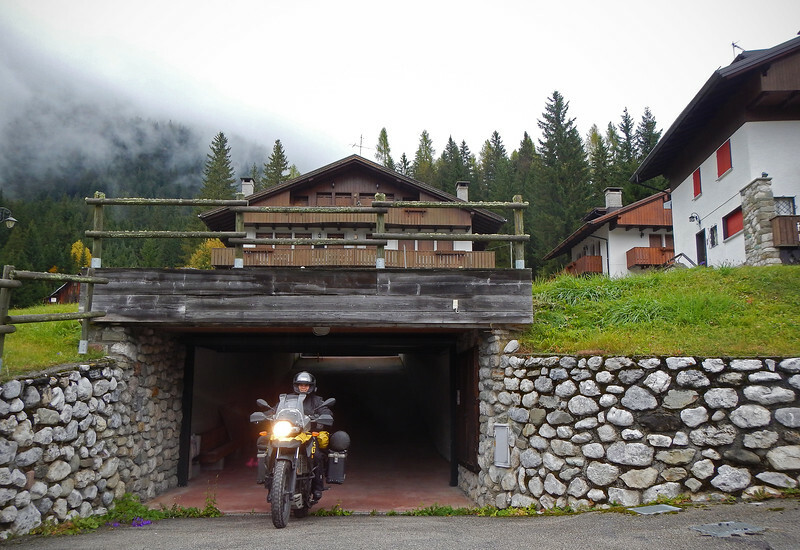 Did I mention our lodge has underground parking? 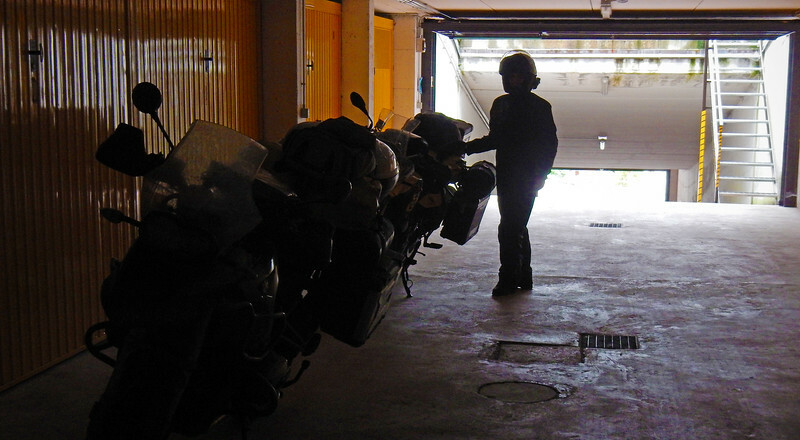 We have the whole garage to ourselves. Sweet! 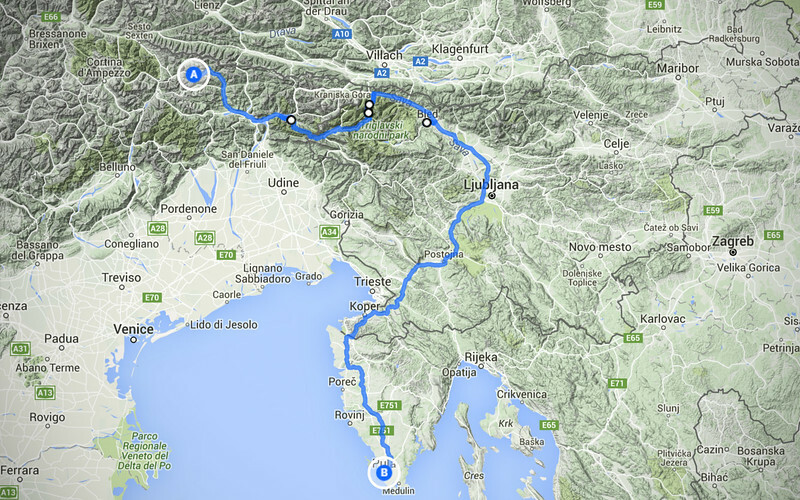 We're going to head east today, through the Regional Nature Park of the Julian Alps, which is just west of the Slovenian border. The damp mountain air this morning chills us to the bone and we keep our rainsuits on for warmth but also because we know it's probably going to rain again later on in the day. 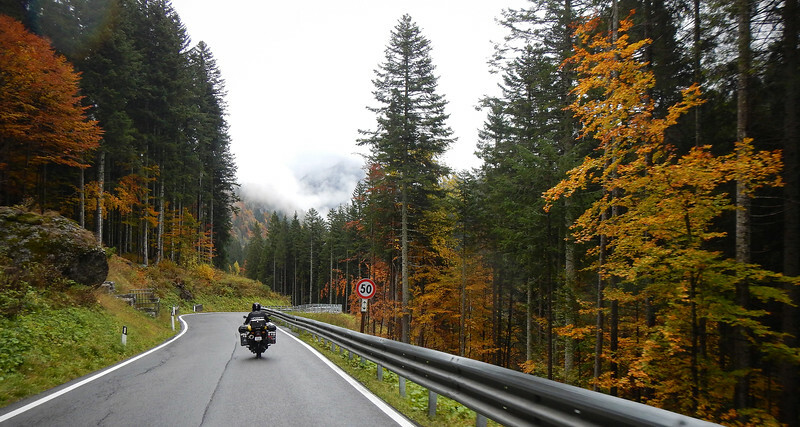 Just across the border, the forest of the Julian Alps continues into the Triglav National Park. As we enter the park, Neda excitedly tells me of all the places she wants to show me in Slovenia. These communicators are wonderful devices. Rather than spending the majority of the last three and a half years of our ride in solitude, we've kept the comms open during the entire time, sharing our experiences and reactions of things we've seen along the way in real-time instead of saving it all up to discuss at the end of each riding day. On this particular day, Neda is in a reflective mood. She tells me about all of the family vacations that her and her family took, crossing into the neighbouring republic to the north. 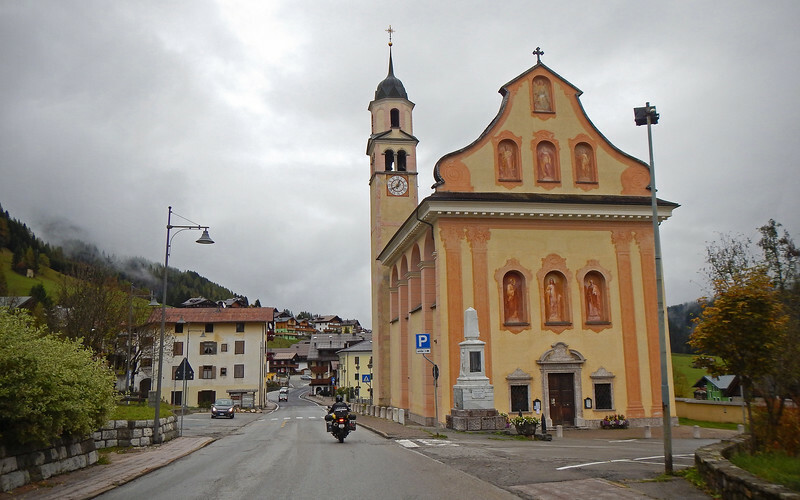 She recounts how she always looked forward to the hiking trips in the mountains of the Slovenian Alps, multi-day treks that fostered in her the love of nature. How they used to stop each evening in mountain lodges, chowing down on delicious hot stew to fuel them for the next day's journey. 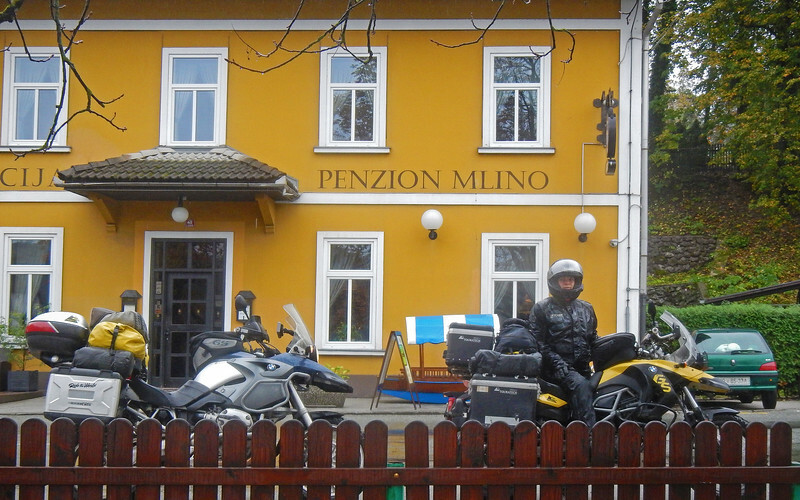 As the ride went on, she recounted her memories of Slovenia and how in the communist system at the time, Yugoslavian families were given "packages" from the government so that they could take vacations. Slovenia was always the more progressive of the republics and is much more affluent now because of it. From the way Neda talked about these trips, Slovenia was always that rich cousin that you looked forward to visiting, but yet made you so envious because they were better off than you. 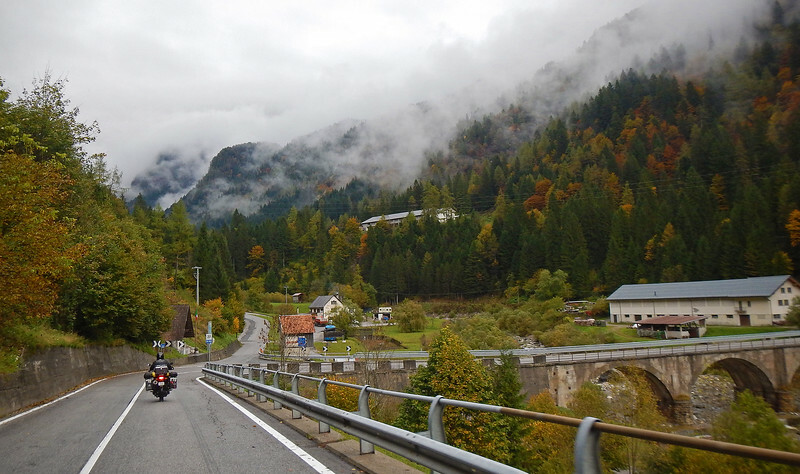 The road through Triglav National Park is narrow and twisty in parts. Which would have been hugely entertaining except that the rains had started up again. That, combined with the slick carpet of fallen leaves on the pavement, made our going tediously overcautious and frustratingly slow. We got to a spot halfway into the park where we finally conceded that this wasn't fun any more. So we bailed on the ride through the park and made an exit out to the highway. 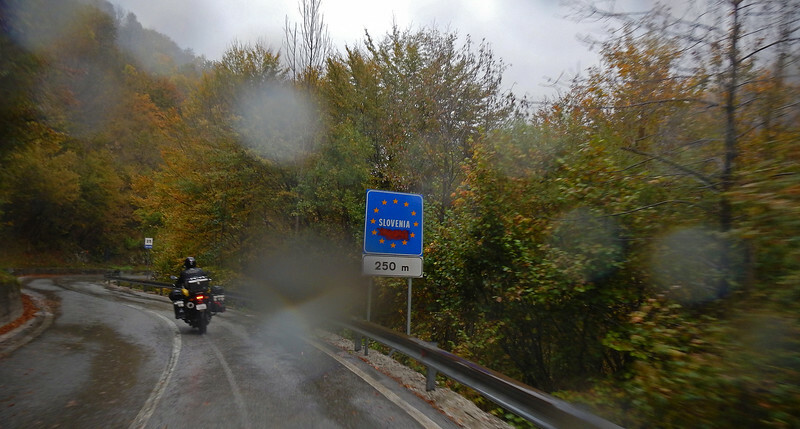 Because this road skirted the border between Italy and Slovenia, we dipped into each country a couple of times, crossing borders like playing hopscotch in the rain. Thankfully everyone's a part of the EU now so we don't have to fill up our passports needlessly with multiple stamps. But Neda is bummed yet again. She was the one who planned this route through Triglav and this was another spoiled opportunity to show me her childhood haunts. 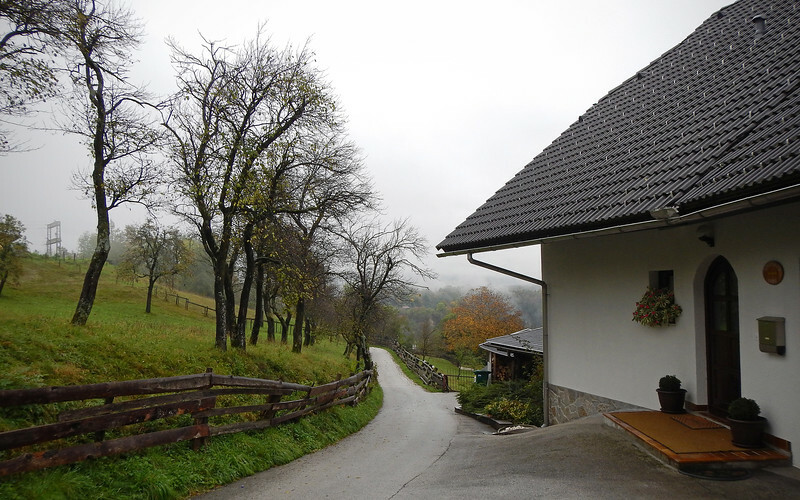 Staying in Bled was way too expensive, so we're in the tiny village of Zasip, about 3kms away from the city. Ever since I've known Neda, she's always told me about Bled. "It's so pretty! ", "I have to take you there someday! ", "You're going to love it, I know you will!" The plan is to wait out the rains and on a sunny day visit the town that Neda has told me so much about. The next day we stare gloomily out the window at the storm clouds overhead. They seem never-ending. We spend the day indoors catching up on e-mail and I pretend to work on the blog, which is getting so far behind that it's embarrassing. 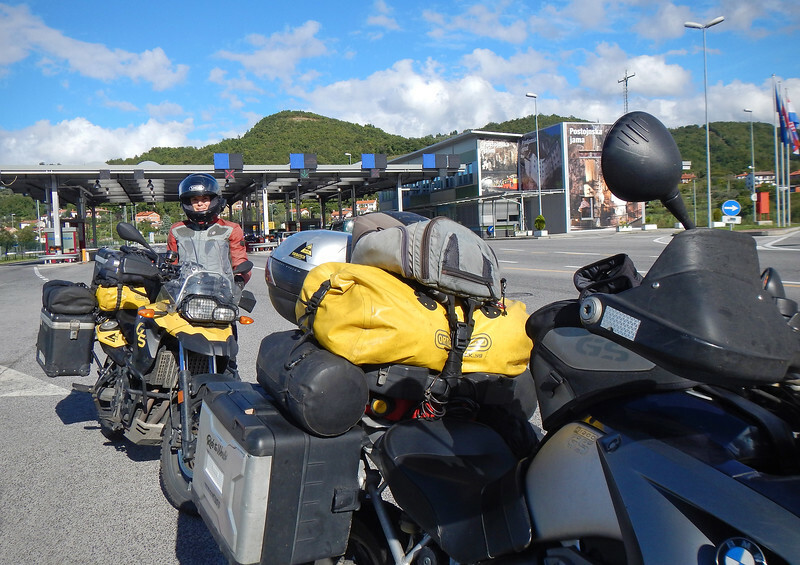 We've already planned to cross the border into Croatia today and we just can't wait anymore for the weather to turn. 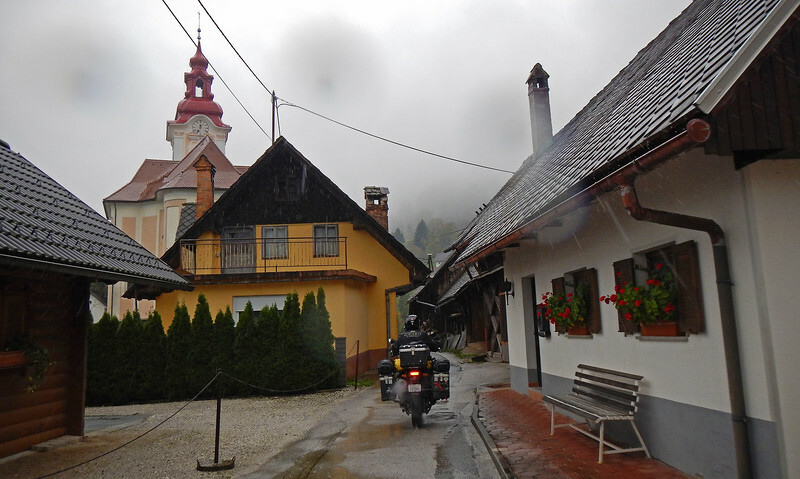 I proposed to Neda that we ride into Bled despite the rain so we can poke around town for a short while before heading to the border. As we were riding through the city, Neda told me about the skiing vacations that her family took up in the mountains. They would go into the old city and skate on the frozen lake, enjoying the beautiful scenery around them. All of that obscured today by the dismal weather. I know Neda's not happy that she can't show off Bled the way she remembers it in her memories, but even I could see how pretty the place is through the raindrops on my helmet visor. 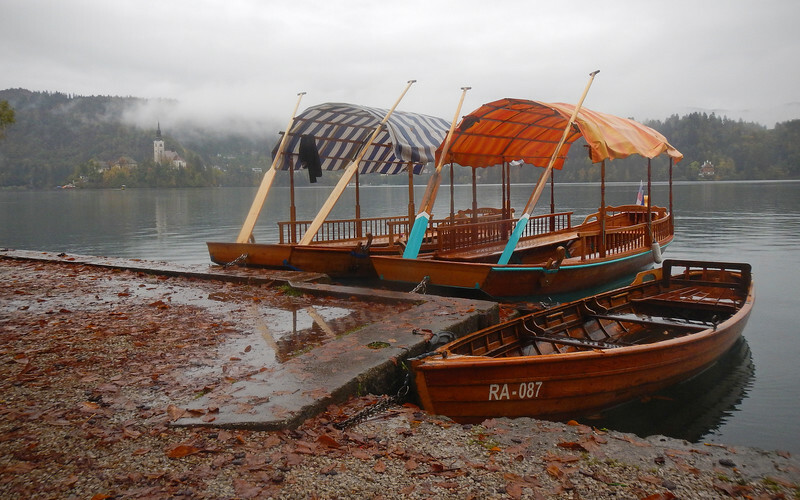 All these charming storefronts, restaurants and hotels lining the boardwalk around Lake Bled, with the mountains of the Julian Alps riding majestically above the town. It's quite beautiful. Nice day for a walk. Not. 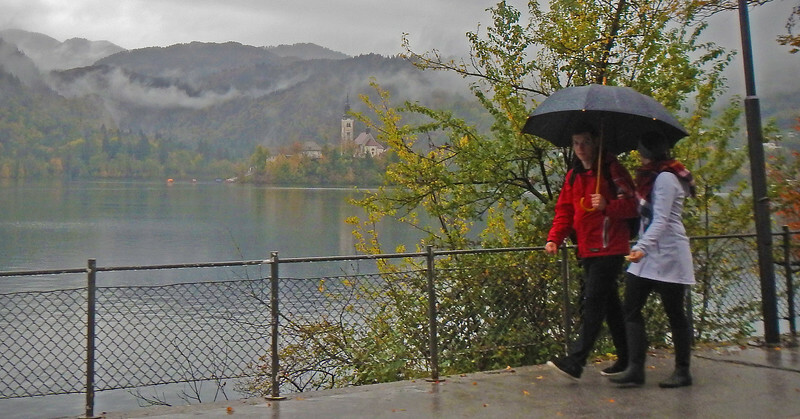 It's too miserable to continue on all of the back roads that Neda has planned for us around Bled. I know she's disappointed, but I try to console her that this is so close to Croatia that we'll get another chance to do them again when the weather is nicer. 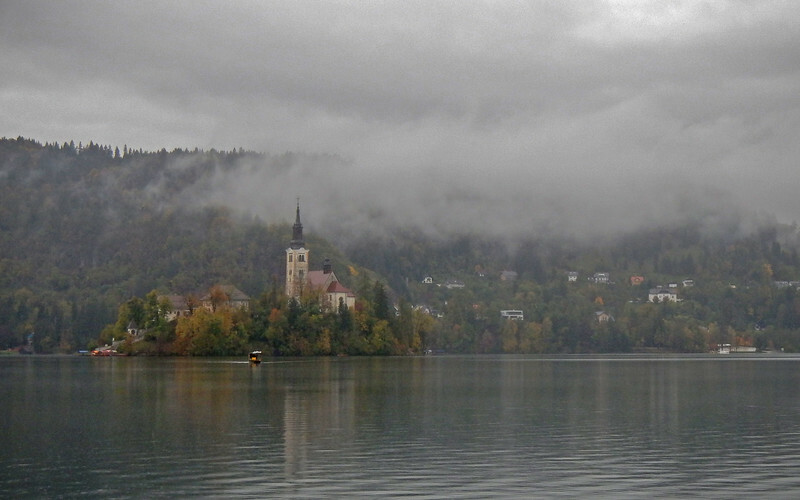 From Bled, we hit the highway to Croatia and Slovenia warps away behind us like a wet memory. It's only two hours on the highway until we reach the Croatian border. 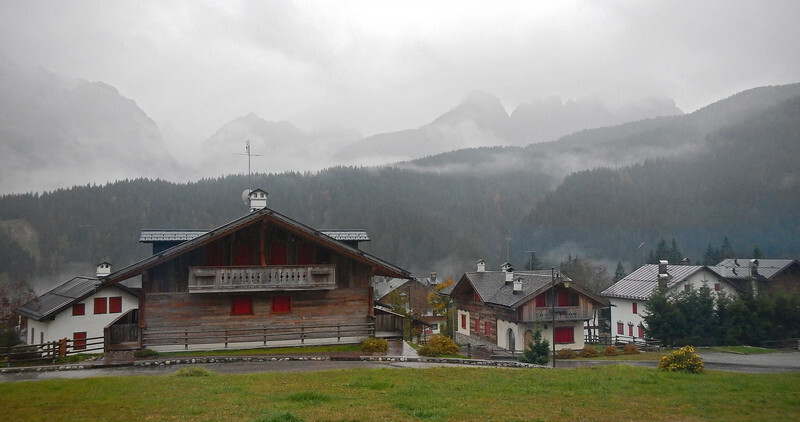 The minute we exited the mountain range of the Alps, the weather clears up magically and we're able to shed all our rainclothes. Rather than alleviating Neda's mood, this just makes her more bitter. As if the Gods themselves were conspiring to ruin her guided tour of her youth. 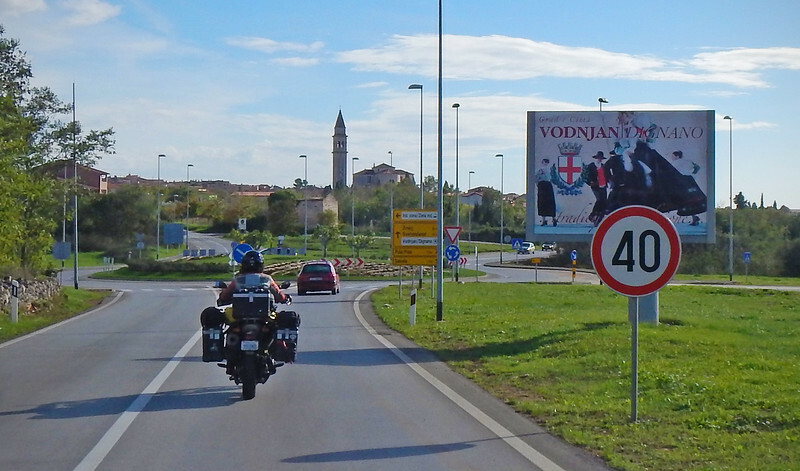 The smooth and well-maintained asphalt of Slovenia's highways fell away to the much less tended/funded crumbling roadways of Croatia. Neda shook her head in annoyance and in her frustration, the old jealousies reared up once again: "Why can't they make the roads welcoming people to Croatia nicer? Why do visitor's first impressions of my country have to look like this?!?" As we rode into Croatia, Neda began to relax again. The fine weather and familiar surroundings finally working their way into lifting her spirits. Over the communicator she tells me, "I'm sorry I wasn't able to show you Slovenia properly so you could see all the places I've always told you about". 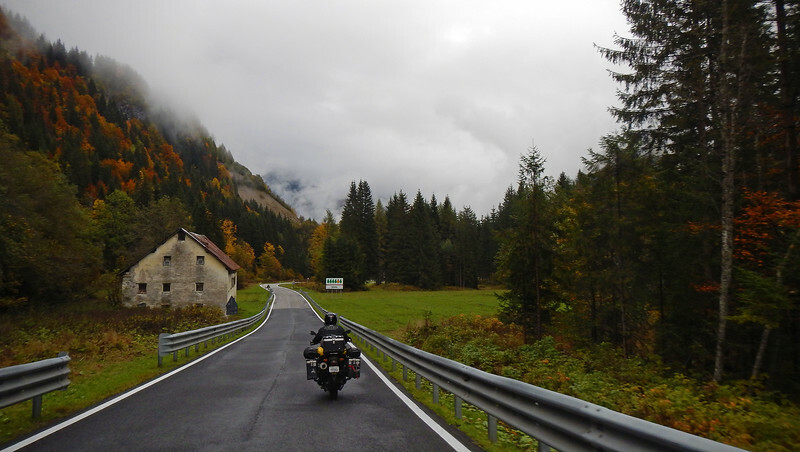 But in my mind, I replayed all of our conversations we had over the last few days while riding through the Slovenian Alps. All of the vivid memories retold with excitement and nostalgia, even the pricklish envies that came through in her voice. You've already shown me those places, Neda. I was with you the entire time.